Buddha Amitayus (Of infinite Life), is the deity associated with the rites that ensure long life. It is closely connected with Amitabha the Deity of Infinite Light and is thought to preside over the Western Paradise (Sukavati). Amitayus is especially worshipped by the Tibetans who believe that by faith and compassion, life can be extended through long lineages. It is believed that with help of Amitayus' life extending energy, one can achieve self-enlightment and welfare for others. The heavy casting, highly intricate base with trailing drapes, very finely incised floral borders and crisp angular features are characteristic of the relatively rare Kangxi period Buddhist bronzes in the Tibetan style, all likely produced in the Imperial workshops. Such figures were offered as presents to members of the Imperial family on birthdays and memorial days. In 1686 (Kangxi's 25th year of reign) for example, the emperor presented his grandmother empress Xiaozhuang with an impressive figure of a four armed Avalokitesvara Shadakshari, believed to be the earliest known dated sculpture to be made in the Imperial palace workshops, see Yang Xin et. al. (eds. ), Cultural Relics of Tibetan Buddhism Collected in the Qing Palace, Forbidden City Publishing House, 1992, cat. no. 51. The largest group of figures of this type were comissioned by the Qianlong emperor for his mother's 60th, 70th and 80th birthday, comprising several thousend figures. 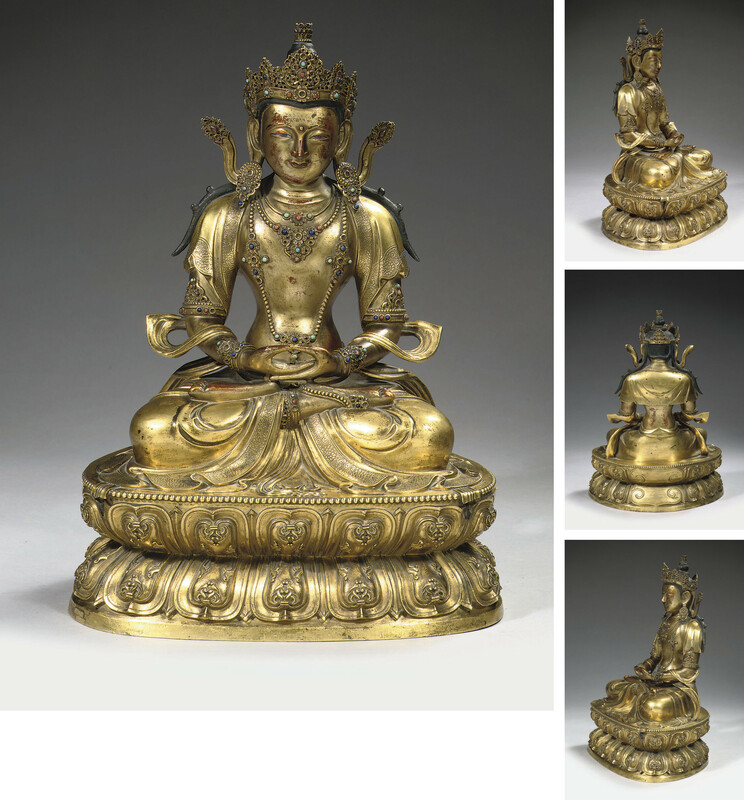 Closely related examples were sold at Christie's New York, 29 November 1990, lot 48, Christie's Amsterdam, 18 October 1995, lot 340 and Christie's Amsterdam, 2 May 2007, lot 344; two further examples are illustrated in Ulrich von Schroeder, Indo-Tibetan Bronzes, 1981, pl. 152A and B, p. 540. The very close correspondance of these known examples would indicate that matrices were used for the fabrication of the wax models required for the casting. On occasion, Christie's has a direct financial interest in lots consigned for sale which may include guaranteeing a minimum price or making an advance to the consignor that is secured solely by consigned property. This is such a lot. This indicates both in cases where Christie's holds the financial interest on its own, and in cases where Christie's has financed all or a part of such interest through a third party. Such third parties generally benefit financially if a guaranteed lot is sold successfully and may incur a loss if the sale is not successful.